Field Trip to the Sphere Museum/¡Excursión de un día a la Finca Seis! 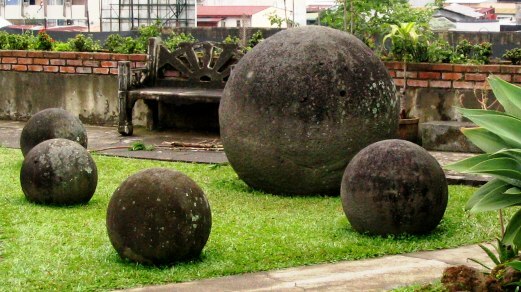 Photo of stone spheres from website: http://www.templeilluminatus.com. Please join us, Saturday, August 29th for a special San Vito Bird Club field excursion to the Museum of the Stone Spheres near Palmar Norte. As always, please try to car pool. We will meet at the entrance to the Wilson Botanical Garden, for a 7:00 am departure. The drive is about 1½ hours. We can have lunch in Palmar following the Museum visit and a bird walk around the grounds. Bring water and hat; weather can be quite hot. Return expected to be 2-3 pm. Hope you can join us! If you have questions or want more information, please contact Greg Homer at eltangaral@gmail.com. Por favor acompáñenos el sábado 29 de agosto en una excursión especial del San Vito Bird Club a El Sitio Museo Finca 6 [Museum of the Stone Spheres] cerca de Palmar norte. Como siempre, por favor intente compartir su carro. VP Greg Homer (photo by Helen LeVasseur). Nos reuniremos en la entrada del Jardín Botánico Wilson y saldremos de allí a las 7:00 am. El trayecto es de alrededor de 1 ½ horas. Podemos almorzar en Palmar después de la visita al Museo y una caminata para pajarear alrededor de los jardines. Traiga agua y sombrero; el clima puede ser algo cálido. Esperamos regresar alrededor de las 2–3 pm. ¡Ojalá nos pueda acompañar! 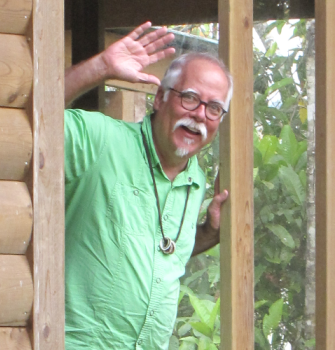 This entry was posted in Special Event and tagged Birding in San Vito Costa Rica, Costa Rican Stone Spheres, El Sitio Museo Finca 6, Free Day Trip, Museum of the Stone Spheres, Palmar Norte by AWOlivieri. Bookmark the permalink.